Dürer was the most important northern European printmaker of the Renaissance. He was a virtuoso engraver and woodcut designer who also experimented with etching. One of a handful of artists, authors, and scholars who brought the Renaissance from Italy to the North, he went twice to study the classicizing and scientific secrets of the Italian masters. Dürer was among the first artists to observe anatomy and to utilize theories of ideal human proportions, and his style is precise and naturalistic. This image is a memento mori, a reminder of the mortality and brevity of life. 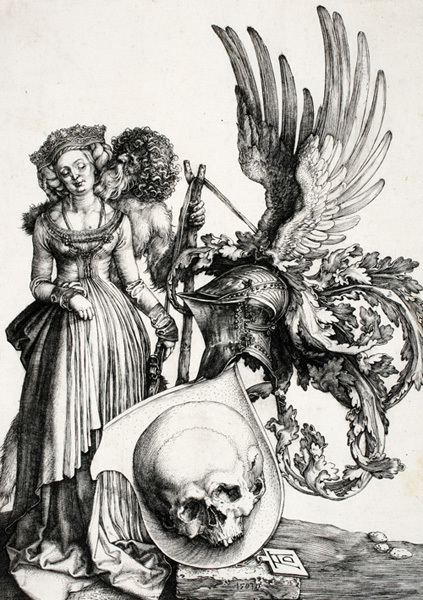 From medieval times, the skull was universally understood as a symbol of death. The woman is costumed in an elegant Nuremberg party dress and the sort of crown worn by a bride at her wedding. Her partner is a wild man, one of a mythical savage race believed to live in the impenetrable forests of the Alps. He symbolizes lust, the opposite of the spiritual ardor embodied in chivalry. Thus, the mismatched couple stands for romantic human love, sacred and profane, both of which are inevitably conquered by death.